We are a Jewish group of individuals and families who have been getting together for holidays, Jewish Education, community, and life cycle events since 1994. This small group shared a common vision: a new community in the spirit of liberal Judaism that would welcome and encourage the participation of individuals and families of varying Jewish lifestyles, including interfaith families. They envisioned a community that was personal, welcoming, and active in Torah study and social action. Congregation Emanu-El is affiliated with the Union for Reform Judaism, the national umbrella organization for Reform Congregations. We currently meet at the synagogue building of Temple Beth Shalom, a conservative congregation, with whom we collaborate on education, holidays, and musical erev Shabbat services. 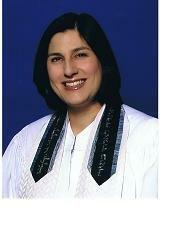 Rabbi Tamar Malino was ordained by Hebrew Union College-Jewish Institute of Religion in May 2001. She has served as a congregational rabbi at Congregation Beth Am in New York City, and at Temple Adat Shalom in Poway, (San Diego), CA, for seven years, where in addition to her clergy responsibilities, she was a popular lecturer in the community and director of the award-winning Hebrew for High School Credit program. For the past four years, Rabbi Malino has worked as the Director of Jewish Life at the Peninsula Jewish Community Center in FosterCity, CA, and upon arriving in Spokane in 2010, as the Executive Director of Spokane Area Jewish Family Services. She will continue to work with SAJFS while also returning to her original passion of serving a congregation. She looks forward to getting to know each and every family at Congregation Emanu-el. She lives on the South Hill with her wife and four children: Aviel, Coby, Shaya and Yair. She can be reached at rabbimalino@spokaneemanu-el.org. Congregation Emanu-El sends out a weekly email bulletin with more information about upcoming services and events of interest. If you would like to receive this bulletin, please send your name and email address to bulletin@spokaneemanu-el.org. The email list is not shared, distributed, or used for other purposes.